I hadn’t intended to write as much as this about a relatively minor injury and its aftermath, but the story seems to want to go on being told. So, if you’re still with me, here is instalment no.3, my 101th blog post. Up till now I haven’t said much about the course itself, except that Roselle Angwin and the people on it were unbelievably kind and helpful. We were a group of fourteen women, fifteen counting Roselle, of varying ages and equally varied backgrounds as writers, from published or about-to-be-published novelists and poets to people whose writing had mainly been of an academic kind and people who hadn’t yet written very much at all. Some had been on the course once or several times before; some had been going to Iona for years and knew as much about the island as any local historian; some, like me, didn’t know it at all but had heard that this place had something special. I’d gone with two intentions: to make more space for writing again and, by doing so, find a new impetus; and to connect deeply with the landscape and the natural world, which for me always means reconnecting with the heart. Others were there for their own reasons, but all of us had come to write, to discover and to share with one another. I’ve been to many excellent poetry workshops where the focus is definitely on the writing. Personal and often painful material arises, of course – how can it not? – but the understanding is that we’re there to write poems. This course was wider in scope. We were there to write if we wished, or not to write if that was what we needed. We were encouraged to open to ourselves in free writing exercises and, if we wished, to be open with others in the group. The fact that the group was all women seemed to allow a particular kind of safety where people shared not only their writing but difficult and sometimes previously hidden experiences. At the start of the morning and evening sessions we were read poems and pieces that might inspire our own writing, and at the beginning of the morning session there was quiet time for free writing or meditation, as we chose. The understanding was that this process was in some sense a spiritual one – in whatever way we might view the spiritual. Poets like Mary Oliver and Robert Hass and philosopher John O’Donohue set a certain tone, but there was much earthiness and laughter, and some hilarious writing by members of the group. For the first couple of days after I came back to Iona I was so shaken and traumatised that it was hard to write anything much. What I did manage write was tinged with mortality and impermanence. I’d heard from the lifeboat superintendent, who rang to ask if I’d mind their video of me being used for training, that their previous rescue from Staffa, a young man who fell over the cliff, had not survived. At no time had I been in serious danger, but there was a frightened place inside me that didn’t quite know that. Meditation was what I needed, and the support of being in the group. The fact that everything was so much more difficult and time-consuming than usual made it harder to put mental energy into writing, so all I could do was listen to others as best I could, write my few unfinished scribblings and simply allow myself to be taken care of, a rare experience if you live alone. After the singing in St Oran’s Chapel, which I wrote about in the previous post, I began to relax again and to feel deeply touched by the kindness around me, in the course sessions and at other times too. My desire to reconnect with the heart had been met not so much in nature but in the company of others. One of the course members gave my ankle some Reiki through the plaster, and I could sense the energy and its goodness. In the final session I sat open-handed and open-hearted, deeply touched by others’ writing (and a little envious that it was so much better than mine), and also touched by the magic of the connection between us all, something that happens in groups only when there is real safety and trust. I had so much to be grateful for, more than I’d ever expected, and I knew I’d come back to writing when I was ready. A postscript: There’s one beach on Iona which is famous for its ‘green stones’: marble with deposits of serpentine, which can be any shade from pale lime to deep emerald. 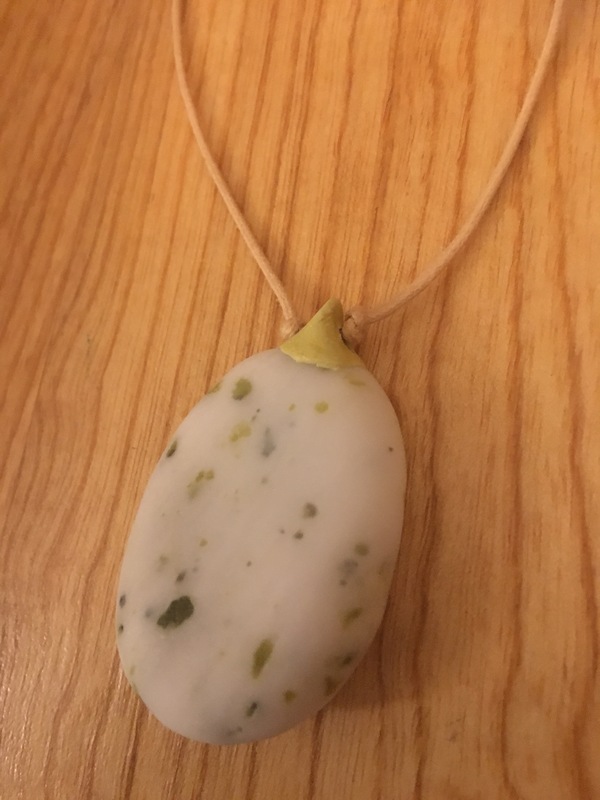 Little flecks of serpentine are known as ‘mermaid’s tears.’ While I was away in hospital the rest of the group had gone on an expedition there and had brought back stones to be made into pendants and necklaces. I was touched that Roselle had thought to bring a stone back for me, and had taken care to choose one that seemed to have my name on it. I’ve worn it a lot since I came back, and it seems to hold some of the goodness I found on Iona. To be continued, and probably concluded, in the next instalment. This entry was posted in Life, Writing and tagged disability, group experience, Iona, Roselle Angwin, spiritual, writing, writing course. Bookmark the permalink.